When you’re only away for a few days with limited luggage space, planning your weekend wardrobe essentials can often be a more taxing affair than prepping for a long-haul trip. A sprawling and energetic metropolis, the Big Apple certainly lives up to its moniker, and everyone wants a slice. Enduring snowy winters and sweltering summers, NYC can seem a city of extremes but spring in Manhattan is all about clever layering to cope with the changeable conditions. A mid-weight coat is a good starting point, as temperature can fluctuate from a few degrees up to the high teens. 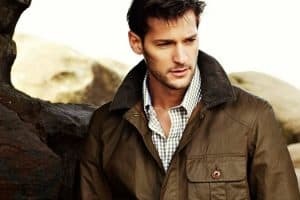 A cotton-linen blend pea coat or thick cotton mac should hit the mark; these can easily be worn with or without extra layers to suit the conditions. Opt for neutral shades that will complement both day and evening looks. A tailored navy blazer will prove a key wardrobe component for any visit to the Big Apple – it can be dressed down in the daytime with casual tees and a lightweight scarf, or it can be worn in the evening formally with a freshly-pressed shirt. A chunky cotton knit is essential for springtime in New York; it will retain warmth on cooler days and add textural interest without feeling oppressively hot. Choose a bold shade to add a welcome splash of spring colour. Smart tapered cotton trousers are a wise choice for this city break and able to adapt to day or evening occasions effortlessly. Try twinning with a waffle-knit during the day, swapping for a smart shirt in the evening. With its long thoroughfares, iconic landmarks and inspiring architecture, walking is an inevitable part of a trip to NYC, so remembering to pack a pair of practical shoes is vital. Leather work wear-inspired toe cap boots and desert boots are both sensible options that can be dressed or up down to suit. Exuding polish and sophistication with its glitzy casinos, grand hotels and sweeping promenades, Nice typifies the style and glamour of the Côte d’Azur. Enjoying a warm, Mediterranean climate that gave rise to the Riviera genre of dress in the 1920s and 1930s, Nice is a destination where casual elegance prevails. A lightweight summer blazer crafted from a linen-cotton blend is a worthy investment for both day and evening; it can be worn with shirting or clean-cut polos in accordance with the formality of the occasion. The Breton tee, an iconic Gallic design, remains a fresh and timeless choice in the Rivera portfolio. Opt for a classic navy or red stripe, or go for one of the alternative colours that are available this season. 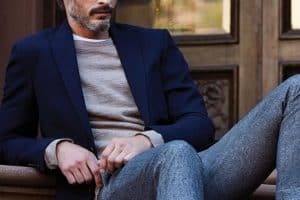 Legwear should also ideally be crafted from cotton or linen – chinos or classic tailored trousers will partner easily with both casual and formal pieces. A classic Riviera footwear style renowned for breathability and comfort, espadrilles are ideal for casual days and beach-bound occasions. This season, consider a luxe pair in suede. Leather deck shoes are another style-appropriate option for a break to Nice. Oh, and don’t forget your straw fedora. One of the most innately stylish cities in the world, Copenhagen is an epicentre of Scandinavian design. Often overshadowed by neighbouring Sweden’s capital, Stockholm, Copenhagen’s cool climate and mix of old-world charm and modernism has inspired its residents to adopt a style of dress that is best described as ‘contemporary functionality with an edge’. Rain is an inevitable ingredient in any spring trip to Scandinavia, so a quality trench/fisherman’s jacket should be the first item on your list. One of the most pedestrian-friendly cities in the world, you’ll find that any trip to Copenhagen will involve covering a lot of ground by foot or bicycle, so comfortable footwear is a must. A luxe pair of colour-pop trainers or explorer hiking boots will look great worn with lean indigo denim or tailored trousers, bringing a contemporary spin to any look. Lightweight and chunky cotton knits are ideal for the city’s spring climate, which can still remain rather cool until the summer months. Layering one with a micro-print shirt will make for a smart combination. The final destination of the Orient Express and the former capital of the Ottoman Empire, Istanbul has an undeniably exotic allure. A city of a thousand minarets, Istanbul boasts glorious Byzantine monuments and Roman ruins, alongside a buzzing nightlife and rich culture that draws from both European and Asian influences. The city just starts to heat up in spring, so dressing can be tricky. A mixture of mid-weight and light clothing and a pair of sunglasses are advisable. 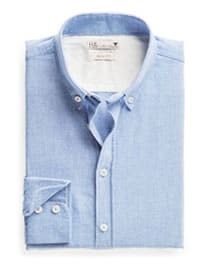 A good supply of quality cotton tees is a must, alongside short-sleeved or utility shirting with functional button-tabs on the sleeves, which can be easily rolled-up when the mercury rises. A fine-gauge cardigan is a better option than a coat, which will be too heavy in the warm spring climate. Wear it in place of outerwear over shirting when the temperature is at its coolest in the mornings and evenings. A summer scarf is a useful item for this city break; it will provide protection from the sun and rogue dust particles, in addition to offering extra coverage should you choose to visit Istanbul’s iconic landmarks, where baring too much skin is best avoided. Being an ancient city built on seven hills, the streets can often be uneven underfoot, so a sturdy pair of leather chukka boots is a safe bet. Rome, the Eternal City, certainly has an enduring sense of style. From contemporary urban attire to traditional polish, the Romans know how to put an outfit together with panache. A deconstructed blazer in either a light or dark shade is just the ticket for maintaining a polished profile when dining on the city’s piazzas in the evening. Layer it with a simple white shirt and don’t forget to finish with a printed silk pocket square. Sleek tassel loafers are the perfect accompaniment for tailoring; opt for the sockless look for a contemporary touch. Leather or suede driving loafers are also a wise choice for negotiating the city’s numerous cobblestone streets during the day. Lean tailored trousers and dark, solid-wash denim are the best legwear choices, offering greater versatility from day to evening. Packing logically for a city break has a lot to do with the climate of your destination. Do your research beforehand so you know what to expect, draw up a list of essentials and dress accordingly. When the weight of your luggage is an overriding factor to consider, remember to only pack items that have a multi-faceted use – those which can be easily recycled and paired with the rest of your travel capsule wardrobe. So, what are your personal tips and tricks for taking the pain out of packing for a city break?